The first Chevrolet Volts left the Detroit-Hamtramck Assembly Plant on Monday destined for initial retail launch markets. Customers in California, Texas, Washington D.C. and New York could receive the world’s first-and-only electric vehicle with extended-range capability in the next few days. These are the first of an expected 160 vehicles to be shipped this week. The heart of the Volt is its Voltec electric propulsion system, which combines battery-only electric driving with an efficient, gas-powered engine giving the Volt up to 379 total miles of driving before having to recharge the battery or fill up the small gas tank. The Volt is the only mass produced U.S.-built electric vehicle. 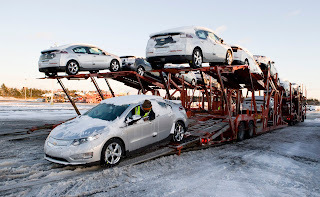 Earlier this year, Chevrolet shipped 15 pre-production Volts to technology enthusiasts and electric vehicle advocates whom were the first consumers to experience the Volt every day under real-world conditions during a 90-day vehicle and charging evaluation program.